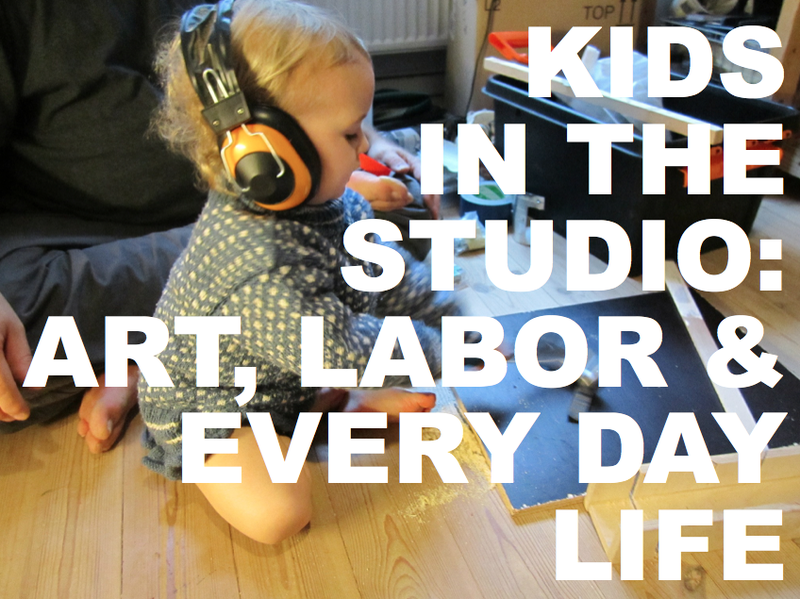 On September 13th, Cultural ReProducers teamed up with the DePaul Art Museum to present Kids in the Studio: Art, Labor, and Everyday Life, led by Copenhagen-based artists Bonnie Fortune and Brett Bloom. The event took place in conjunction with Fires Will Burn and Ink, Paper, Politics, two exhibitions of political printmedia that provided the perfect context for a conversation about the work that both artists and parents do. Brett and Bonnie kicked things off by sharing their own approach to combining politics, creative practice and family, and discussed other projects that run counter to an art world that increasingly cuts artists off from their everyday lives. Manifestos and models presented included Palle Nielsen’s kid-centered installation “The Model: A Model for a Qualitative Society” at Stockholm’s Moderna Museet, Andrea Francke’s “Invisible Spaces of Parenthood” working daycare center as art installation, and Nils Norman’s adventure playground research and sculptural projects. After several people started taking cell phone pictures of the screen, Brett and Bonnie generously offered to share their slideshow and resources with everyone (if you’d like a copy, let us know). They opened the event into a lively group discussion that nobody wanted to leave, which spilled over into the all-ages reception afterwards. In a sunny lecture room upstairs, kids were invited to express their own agendas with colored paper, rubber stamps, and markers. 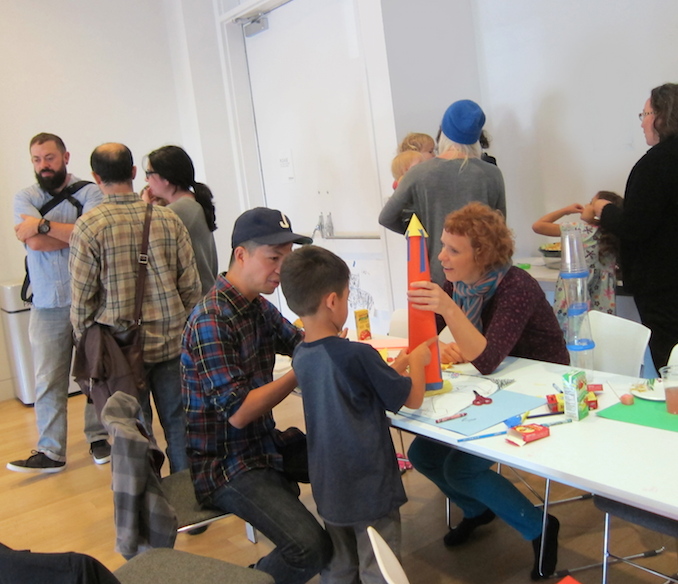 By the time the adults headed up for the all-ages reception, the room was festooned with exquisite corpse drawings, a plastic cup tower, and an amazing paper rocket designed with the help of our brilliant childcare workers Ash, Macon and Craig. We seemed to hit just the right mix of timing and people for this one, and the scene a looked a lot like the early proposal drawings we used to apply for funding for this event series: exuberant kids mobbed the refreshment and activity tables while adults connected over ideas raised in the lecture and scribbled down each other’s contact information for future conversations. 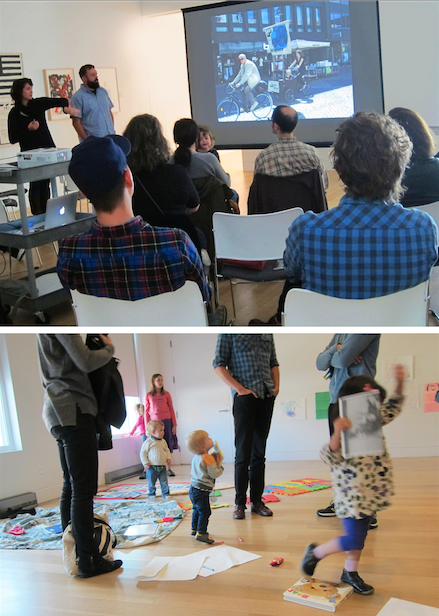 Bonus: everyone went home with an experimental risograph zine designed by 3-year old Ada, created while Brett was working on Temporary Services' latest project. On Saturday, December 6th we look forward to expanding this dialogue through the final installment in our series: Making It What We Need, a workshop and conversation generating concrete ideas about how institutions can support the work of cultural producers who are working it out as parents. Among other things, this event will help shape the future of what Cultural ReProducers is and does. We’d love to include your voice. 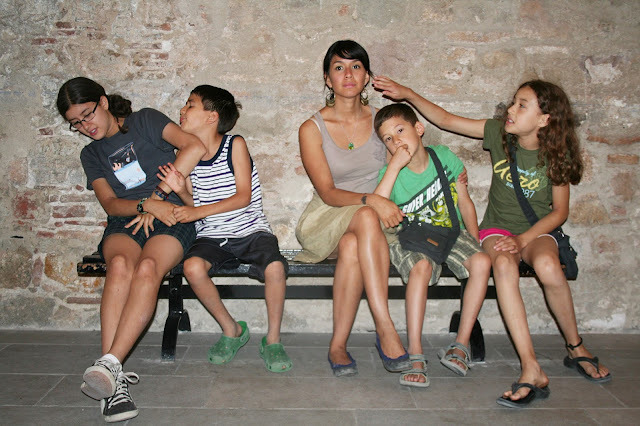 This event will be presented by Cultural ReProducers organizers Christa Donner and Selina Trepp in conjunction with the exhibition Division of Labor: Chicago Artist Parents, on view at the Glass Curtain Gallery from November 20th, 2014 - February 14th, 2015. Mark your calendars, and stay tuned for more information!